A woman cast her vote in front of an election worker during the presidential election in Afghanistan. On April 5, 2014, citizens in Afghanistan voted in a historic election. It was historic because it represented the first democratic transfer of presidential power in the country’s history. Voters faced cold and rainy weather as well as threats of violence in casting their votes. In this election, about 60 percent of all eligible voters went to the polls. They cast their votes to elect a replacement for outgoing President Hamid Karzai. Karzai has been president for two six-year terms. By law, he cannot run for a third term. It is estimated that seven million Afghans came out to vote. This was an increase from the last election, in 2009, when less than five million Afghans voted. The 2009 election was disrupted by fraud, or dishonest methods, and violence. Many feared that the Taliban, a militant group, would disrupt this year’s election. Due to high security, however, the Taliban failed to launch any major attacks. Still, 20 people were killed and 40 were wounded due to attacks on polling sites. Many voting locations had to be closed due to security concerns. Yet, the Afghan people were not swayed from voting. Many hope to elect a strong leader who will help bring peace to their country. After the voting was finished, two frontrunners emerged. They are former Foreign Minister Abdullah Abdullah and former Finance Minister Ashraf Ghani Ahmadzai. Out of the 11 candidates, those two have the most votes so far. However, neither one received the majority, or more than 50 percent, of the votes. Because there is no clear winner, a runoff election will be held on May 28. A runoff election is not unusual when there are so many candidates competing for votes. Only one-third of the voters were women, but this was an improvement from the past. When Afghanistan was under Taliban rule, women were not allowed to vote at all. This time, some of the candidates even ran with female vice presidential running mates. Other candidates expressed their support of women’s rights. The outcome of the election is important to Afghanistan’s future. It will also help decide the level of American support that will remain in the country. President Karzai has refused to sign a security agreement with the United States. The agreement would allow some peacekeeping U.S. troops to remain in Afghanistan after the United States withdraws most of its forces by the end of this year. The leading candidates in this election have said they would sign the agreement. 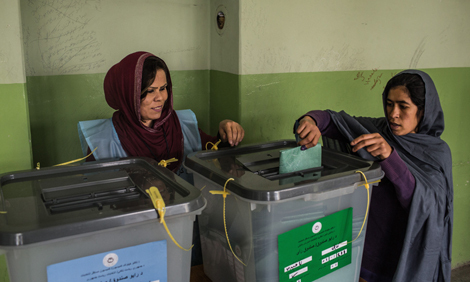 How many Afghans voted in their country's 2014 presidential election? How many of the voters were women?